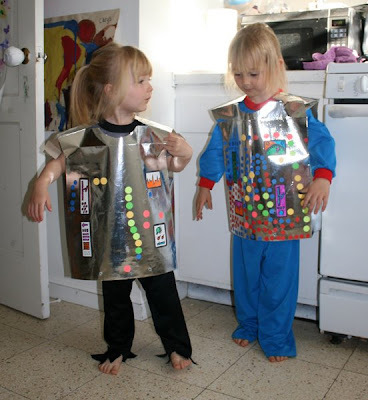 I know we did robot costumes before, but, well, my kids want to be fracking toasters, what can I say? (apologies to non Battlestar Galactica fans). 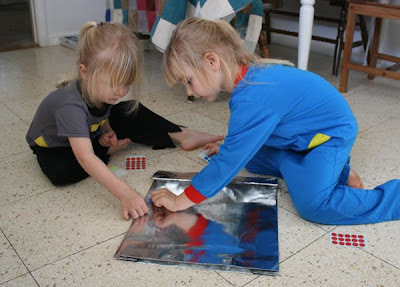 I saw that the dollar store were doing some silver gift bags that were perfect preschooler head and body dimensions, so I picked up a couple each for my girls. 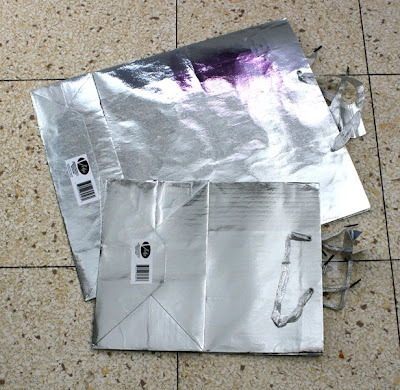 We cut arm holes and a head hole in the bigger bag and a little peeking out hole in the robot head bag. They spent quite a while adding loads of "buttons" in the form of cheap sticker dots and then I drew a few panels on larger stickers we had and they coloured those ones in. 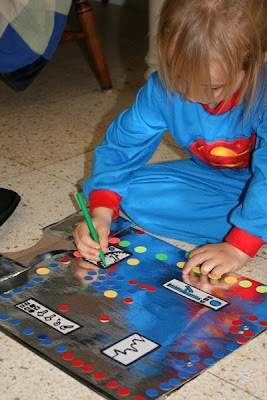 As you can see from the outfits they had on, they had spent the other half of the afternoon being super heros. It's a hectic life being three and four years old! Why do they want to be robots so badly? It's a pretty fun phase though. The robot voices and funny walks slay me. I should video them next time they go all toddlerbot on me. I did plan on giving them some antenna and decorating the robot head bags some more, but they were all into playing make believe robots by the time we had done the bodies, so I'll leave that for another day. Brilliant!! We enjoy being robots in this house too. Halloween was so funny, when we were dancing to spooky tunes Egg (who was dressed as a wiggle, not a robot) danced the robot, lmao, hilarious. Such a great idea with the bags!!! 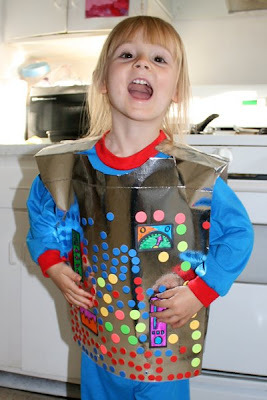 Fantastic robot costumes - looks like the kids are enjoying them too! Oh my gosh, you're like the best mom ever!! :) Hilarious and awesome. 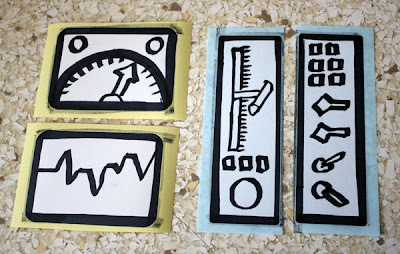 I'm posting about this on Dollar Store Crafts on 6/28 - thanks! New to your blog, and I LOVE these. Thank you for sharing! I found your site in a round about way, but wow, I just have to say how great an idea this is! Cheap and cheerful!! 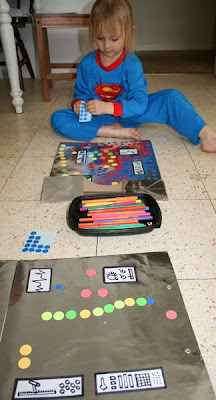 I love the idea of using a gift bag as a costume, it's fantastic value and allows kids (and big kids) to be creative in making a unique costume. Yippee! This post just made my day! I have a little boy who is going to have the time of his life tomorrow when we get back from the Dollarstore! Thank you so much for your wonderful ideas! Thanks! 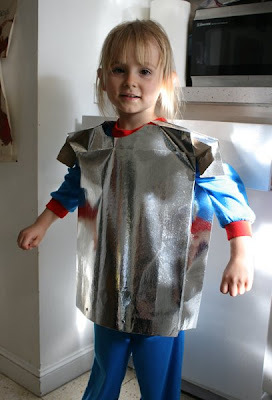 I was searching for some ideas for robot costumes for my daughter's halloween costume. I'm so thrilled I came across your blog. Tons of fabulous ideas! If you are interested to take a gander I have a blog at www.myglasshouse.net. Cheers! 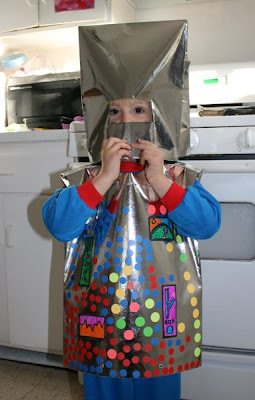 My son wants to be a robot this year. This is perfect. 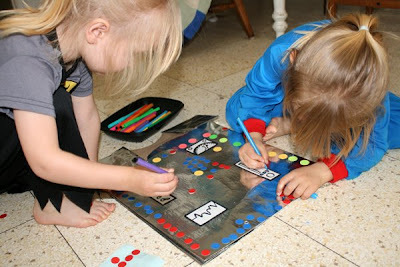 Easy to make and inexpensive!